Whenever people talk about the 'next thing' in publishing, they often look at what the media industry is already doing and then try to imagine something slightly more modern. But the real trends are often coming from outside the industry. This is the case with the growing trend of 'content as a service'. Outside trends (often fueled by better data or a more specific need), create new kinds of services that take over parts of what we used to do as publishers. And if you, as a publisher, don't watch out for this, you will become the least valuable choice, especially if you just keep doing what you are doing today. In this Plus article, I go into the details of what is happening with these trends, and why. The latest episode of the Baekdal Plus podcast is out and I'm talking about two exciting things. First, I talk about the trend that we see with advertising - how more and more of the ad budgets are moving to non-media channels. This is a very important trend to understand, which is often overlooked when publishers talk about channels like Google. While it's certainly true that Google is dominating the digital advertising market, it's mainly because Google is offering a 'non-media space' where the focus creates a far better purchase intent for brands. So in the first part of the podcast, I talk about why this is and what publishers can do about it. Also, this is partly based on the Plus report I wrote a couple of weeks ago on the same topic. So, if you want to learn even more about that, check that out as well. Secondly, I talk about the fine which the UK plans to issue to Facebook because of the Cambridge Analytica scandal. However, my focus is not really on either Facebook or Cambridge Analytica. I look at how the UK (and by extension also the EU) is interpreting how they define privacy and consent. This is another very important thing for publishers to pay attention to, because it illustrates how they will look at GDPR and ePrivacy, and how you as a publisher really need to rethink the way you operate today. For one thing, Facebook wasn't the only company that was fined. The UK also fined a publisher for allowing a 3rd party to use their data for political targeting. If you want to skip to the part where I talk about this, it starts 25:10 into the podcast (about half-way through). One of my pet peeves when it comes to traditional publishers is that every time they try to do something new, they end up just doing the same thing they have always done all over again. The problem is that they lack focus, and because of that don't know how to define themselves. This leads to publishers creating channels where they fail to ever actually explain what they are supposed to be doing. Last month for instance, we heard how two people, formerly from Vogue, had decided to create a new magazine. And the focus? a lively mix of how-to stories and personal essays ... with topics ranging from fashion and interior design to culture and parenting" aimed to be "the ultimate destination for all things child-related for millennial parents. In other words, exactly the same as what every other magazine is doing. A bit of everything for anyone. Allow me to unfairly single out Quartz as illustration of how idiotic journalists self-obsession is. 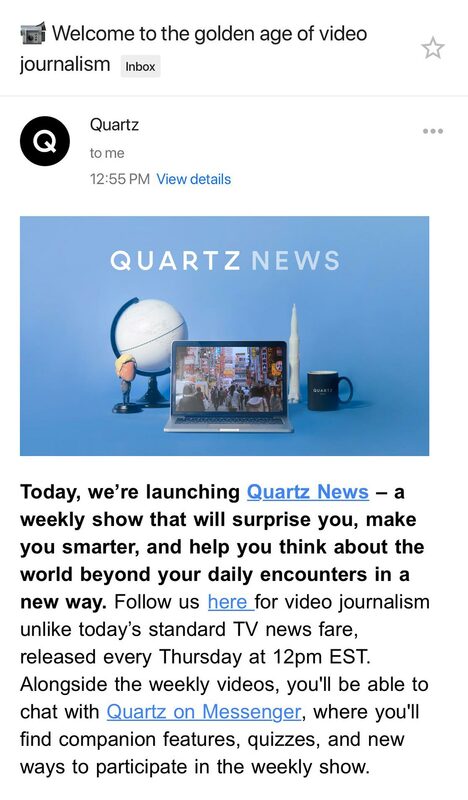 See this email on new QZ video show: instead of talking about the show, emphasis is how they're reinventing video journalism. But who in their audience gives a f*** about that?? The announcement was then followed up by a tweet from Quartz that was supposed to highlight what they are offering, but it too explains nothing about anything. Trying to understand how this whole system works. Global. Where is this information coming from. What is going on? Surprising. What the world wants. It's a new phenomenon. In depth. There is not an immediate cause and effect. We are sort of meeting the machines in the middle. A new story, from around the world, every week. This is Quartz News. I'm sorry, who...where...what is this again? Quartz News is a weekly deep dive into the global issues shaping our future. In other words: 'We don't have a focus. But watch us to see some videos about random things'. And the first video is about blockchain (in Venezuela), even though they tell you in the video that this is basically not going to work. So, your first story is to tell people that you don't really have a story? Why do traditional publishers keep doing this? You are still defining your editorial focus as if we live in a world where 'oh... here are more random stories' is what people are looking for. I'm not complaining about Quartz' quality or their journalism. Quartz is a high-end, quality news site. But the editorial model is based on the idea that people just want to watch random content about things that don't have any personal relevance. Is that really what people want today? Think about the type of moment or intent that you are designing for here. What moment fits into a somewhat long-form news story about something random? What type of person would need this type of information? ... and when? So, the traditional media industry just keeps doing the same thing over and over ...and over ...and over ...and over. There is zero innovation. Zero different levels of thinking. But worst of all, nobody is asking if a random article is actually the most valuable and relevant content to make. This is the problem that I see all the time, which illustrates an industry that is completely stuck in the mindset that 'random news for random people' is the only thing it can do. What if that is not the only way to publish? ... just think about this.